The report displays the inventory of the organization from the day of foundation until the selected date. In no filter is defined, the whole inventory will be displayed for all of the products and stockrooms. Till Date Mandatory field. The report will display the calculated inventory from the day of foundation until this date. Catalogic Number Select a specific product, to display its historical inventory. Stockroom Select a specific stockroom from the list, to display its historical inventory. Section Choose a specific section of the selected stockroom (optional) to display its historical inventory only. 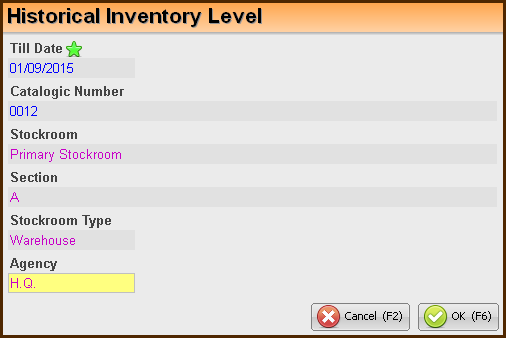 Stockroom Type Select the required stockroom type, to display the historical inventory of all of the stockrooms of this type only. The report displays the historical inventory, according to the above filter fields. The data for the report is also taken from the archive tables, according to the selected date. The report also displays a negative inventory, which is marked with a different background in the quantity field. The selected filters will be displayed at the top of the report.